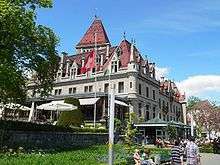 The Château d'Ouchy ("Castle of Ouchy") is an old medieval castle of Lausanne (Switzerland) that has since been converted into a hotel. It was first constructed by the Bishop of Lausanne as a tower on the banks of Lake Léman around 1170. A century later, it was rebuilt and transformed into a fortified residence for bishops, particularly for Guillaume de Varax. It was also used as prison. The castle was abandoned and its tower reduced to ashes in 1609. The canton of Vaud recovered it after the departure of the Berneses and sold off part of the land to Jean-Jacques Mercier in 1885. The new owner radically transformed the castle by demolishing the ruins and old buildings, leaving only the tower. The castle was rebuilt in the neo-gothic style between 1889 and 1893 and converted into a hotel. Wikimedia Commons has media related to Château d'Ouchy. This article is issued from Wikipedia - version of the 6/27/2015. The text is available under the Creative Commons Attribution/Share Alike but additional terms may apply for the media files.